If you are wondering how to prevent leg cramps when cycling and you are looking for a simple answer that will stop leg cramps then you might be disappointed. The truth is there is no single solution from the medical and sport science world that can prevent riders getting leg cramps when cycling. After recently having extremely bad cramp during the inferno that was the 2013 La Marmotte I was keen to find out possible reasons that explained why my legs were so bad on Alpe d’Huez! Perhaps the most commonly cited reason for leg cramps when cycling is simple dehydration and loss of vial electrolyte’s due to excessive sweating. However there is very little medical evidence to support this theory and when you think about it why would a cramp in your thigh or calf be caused by electrolyte depletion and dehydration that affects your whole body? Whilst keeping hydrated is critical to successful endurance performance and electrolytes are important for nerve and muscle function there is not an empirical case to suggest electrolyte depletion and dehydration is the cause of localised leg cramps when cycling. If you have experienced thigh cramp before did it set in when you stood out of the saddle and “shortened” the thigh? Is your calf cramp worst when you are pulling through the bottom of the pedal stroke when the calf is shortest? A bike that doesn’t fit you will not enable you to use your muscles efficiently which in turn may be a contributory factor of neuromuscular fatigue. The most likely explanation for leg cramps when cycling is that due to repetitive use specific muscles get fatigued. This fatigue contributes to a breakdown in the normally efficient neuromuscular pathways that control the movement of our muscles. Does that list sound familiar? It does to me. At La Marmotte I rode for twice as long as my longest ride this season, rode in fast (too fast) pacelines in the valleys and the temperature topped 34C on the Galibier. For me this list is quite comforting as I had presumed it was an issue of nutrition and hydration which was itself confusing as I paced my nutrition well and used nuun to keep my electrolytes in balance. So if your mind is screaming “shut up legs” your body is not responding you may be suffering leg cramps due to neuromuscular fatigue. OK so there is not much evidence to support electrolyte depletion and dehydration as the cause of localized cramping but we do know that electrolytes (in particular sodium) play a critical role in the way muscles communicate the messages of our neuro system and there is consistent evidence to support dehydration as one of the major contributors to fatigue. We recommend the zero calorie sports drink nuun that helps riders to control electrolyte balance in training and competition. By stretching your leg muscles and lower back you will increase the range of movement of your muscles and make them work more efficiently. Use strength training as the building block of your season during the winter to increase the efficiency and power of your muscles. By having a stronger core you well waste less energy swaying from side to side, the energy that you use to turn the pedals will be directed down forward and this will in turn lead to greater efficiency. Know your limits! If you ride consistently above lactate threshold you will build lactate on the muscles and this will inhibit muscle function which contributes to neuromuscular fatigue. Completing a cycling threshold test will allow you to ride below your threshold in sportives and improve your fitness with threshold intervals. By repeatedly riding above and below your threshold on a training ride you can improve the way that your body processes the waste products in your muscles. This is often easiest to do on an indoor trainer using a training video such as Blender by The Sufferfest which aims to improve endurance through extended interval training. It’s important to build race pace sessions into your training plan and consider these tips on how to choose a cycling training camp that will mimic the climate and terrain that you will encounter in your “A” race. Tip #8 Ride Hills, Lots. Most riders experience leg cramps when cycling in the Alps after having done insufficient conditioning. Follow these climbing training tips to help improve your technique and fitness before you swap your local hills for the Alps. Cramp will often set in just after you’ve stopped riding for a while and attempt to restart. One way to prepare for a long distance sportive where you will stop for feed stations is to replicate this on training rides by stopping for coffee and cake (any excuse). Try to learn what works best for you – put your feet up? Cool down for 5 minutes as you approach the stop? Warm up slowly? Stretch? Leg warmers on? Stop for 5 pr 10 minutes? Experiment and see what helps you to avoid cramp when you get going again. As Dr Gary Palmer explains it is recommended to set goals for every ride. Investing in a proper bike fit can help to ensure that your muscles are working in their optimal range and in turn help to prevent prevent leg cramps when cycling. 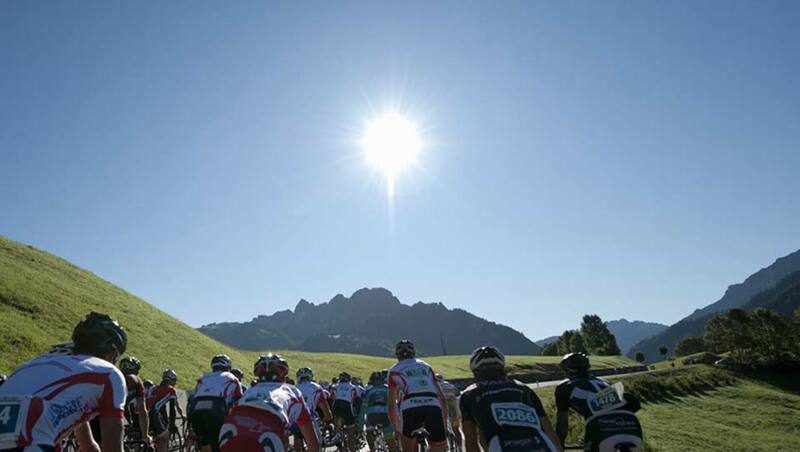 If you are training for the Etape du Tour, La Marmotte or Maratona dles Dolomites why not use a Swiss sportive as part of an intense race specific training block? At Brevet we run challenging cycling training camps featuring Swiss sportives designed to give you race experience in the Alps.